Equipment | Bearsden & Milngavie Ramblers. For day walking, the rucksack needs to be big enough to carry items like a spare fleece or sweater for colder conditions and waterproofs if they are likely to be required. On the other hand, if the rucksack is too big, you will be tempted to carry more than you really need! Small Daysacks have a volume of between 15 and 35 litres and are designed, as their name suggests, to be able to carry only enough for a day’s walking. Often then have no internal support so all of the weight is carried on the shoulders. They usually have a main compartment and one or more side pockets. Larger Walking Rucksacks have a volume between 35 and 55 litres and are designed for a longer or more difficult day walk or for walks spanning a few days. They are ideal for leaders who usually carry additional safety and first-aid equipment. They usually have a main compartment, side pockets and a lid pocket. You should really try a rucksack, preferably with a load inside, before purchasing. Look for comfortable shoulder straps and a padded hipbelt for larger rucksacks. Larger rucksacks will also have some kind of internal frame or padding to keep air circulating between rucksack and your back to keep your back cool. Some rucksacks are available in Women’s Fit variations which are specially designed to be more comfortable for women. 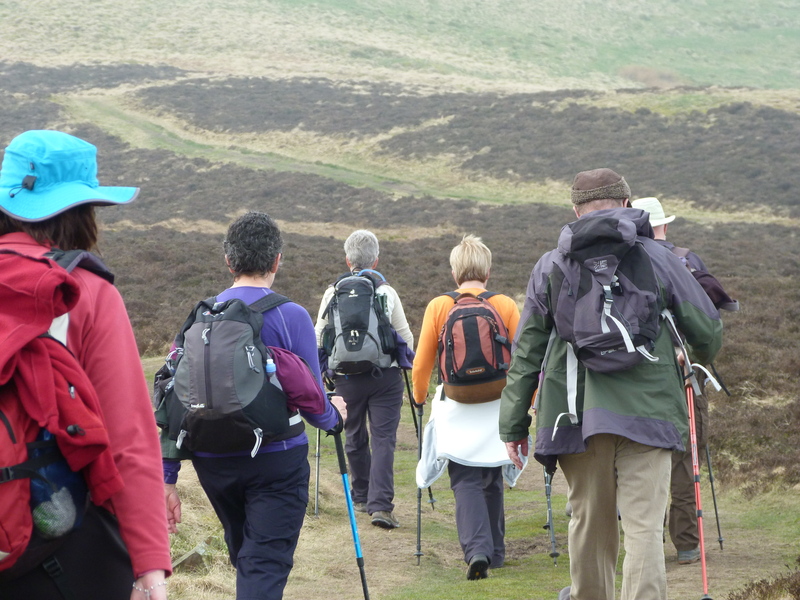 Facilities If you use walking poles, make sure that your rucksack has fastenings to carry them safely. You might also look for a front pocket for carrying maps etc. Although most rucksacks are made from waterproofed fabrics, very few are completely waterproof. An internal, waterproof rucksack liner or an external waterproof cover are valuable accessories. Walking poles are simply high tech versions of the traditional walking stick. Many people like to use one or two poles to help their stability when crossing rough ground or steep slopes and to spread the load of ascending and descending from the legs to the arms – a bit like having a 4×4 to cross difficult terrain. Some poles have internal springs to act as shock absorbers. These require slighly more energy to be expended and some people like them – others don’t. Whatever type you choose, you need to hold and use them properly. For more advice, see Peter Clinch’s Hiking Poles Page. Walking poles are not suitable for winter walking in ice and snow conditions and are not a substitute for an ice axe. Carrying sufficient liquids is important, particularly in hot weather. Many people carry a water bottle and a thermos of soup, hot water or coffee. Some walkers prefer a hydration system consisting of a plastic pouch containing water, carried in the rucksack. This has a plastic tube, leading from the rucksack to a mouthpiece clipped to the rucksack strap. You can then drink by sucking at any time, without having to find and open your water bottle. The main things to carry are dressings for cuts and grazes and treatment for blisters (like Compeed or other proprietary products). Antiseptic cream and an antihistamine cream for bites and stings are useful additions, along with insect repellant. This is a thin, lightweight aluminium foil blanket of the type draped over runners at the end of a marathon. It takes up little space and is invaluable to cover someone who cannot be moved or to keep warm if you have to take shelter in bad weather. At its simplest, this is a heavy duty plastic bag, about the same size and shape as a sleeping bag, with a similar purpose. Inside it, in an emergency, you are protected from the wind and rain and your body heat is retained. You can also get a more effective foil version, similar to the thermal blanket. These are essential items of equipment for a walker. There are as number of different types of map available and several types of compass. Occasionally we arrange navigation days which will be advertised on the programme. If you intend to walk on the hills on your own, ensure you are confident in your navigation skills. Both are also essential items of equipment. The whistle is valuable for summoning help in an emergency and signalling your position at that time. Keep one attached to your jacket or rucksac. A small, bright torch can be used in the same way, to summon help or signal your position, as well being useful to light a path if you get caught when darkness descends. A useful type of torch in those circumstances is a head light which straps around the head and leaves the hands free. If you can be bothered with the additional weight, a good pair of binoculars is ideal for anyone interested in wildlife as well as those who like to examine their surroundings – or even if you’re just ’nosey’! Although this can be useful in an emergency, you should not rely on it for summoning help, since mobile phone coverage is very variable, particularly in the remoter and hillier areas that you might be walking. A GPS receiver is a handheld electronic device that finds its exact position on the earth by using signals from 3 or more orbiting satellites. Depending on the model used and its sophistication, it can pinpoint its position and height within a few metres. Used appropriately, it will display the route you have taken, distance travelled, height climbed and other information on its screen. Some models allow the downloading of suitable maps (like Ordnance Survey ones) so that you can see your progress on the screen across the map. The use of GPS receivers is a growing subject and you might like to follow some of the links in the Links section of this website for further information. On an important safety note, you should not rely solely on a GPS receiver for your navigation when out walking. Like any electronic device, it can fail if the batteries run down or for other reasons. You should always be able to navigate yourself out of trouble using a map and compass.